My work as a whole is a range of explorations into surface and texture informed by features and processes of the natural landscape. The material I work with is blown glass, worked both hot and cold- the forms are first created in the hot shop with molten glass, and then manipulated further through carving in the cold shop. 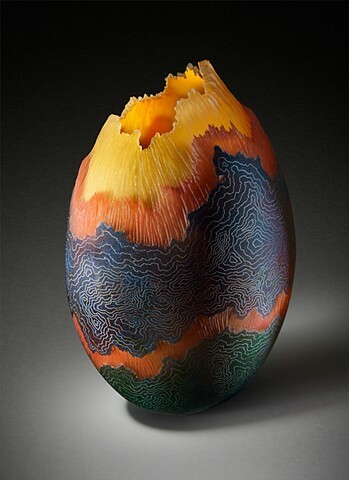 My glasswork consists of multiple layers, and I use various techniques to create and reveal a dynamic between the interior and exterior colors and surfaces. I explore the line between organic and natural, vs. controlled and geometric, and between ephemeral vs. artifactual, with pieces that create a sense of intimacy and intrigue, made physical with an unexpected material.